MUST HAVE TAKEN CARBINE 2 PRIOR TO THIS CLASS! 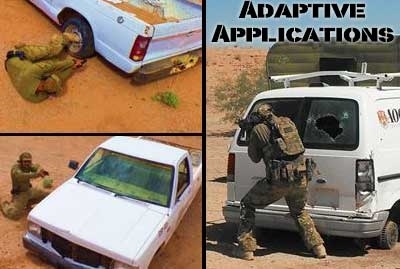 Adaptive Applications is designed to give the intermediate or advanced shooter a day on the range. This is a day based on drills. We will have organized drills in and around cars, barricades, VTAC wall, run and gun drills, multiple target engagements and more. Simply put, this is an organized day of running your gun on the playground. Students provide their own gun and ammo: 500rds rifle ammo minimum. 250rds handgun ammo recommended. A functional and practical carbine or battle rifle chambered in 5.56x45, 5.45x39, 300 Blackout, 7.62x39, 7.62x51. If available, a spare weapon system is also an excellent idea. Each student should have a minimum of 4 working magazines for carbine and 3 for pistol.